The taiga, or boreal forest, stretches across Canada, Russia and other northern countries. Characterized by long, harsh winters and coniferous forests, this habitat serves as home to numerous animal species, including the bobcat, North America's most prevalent wild feline. These cats live as far south as Mexico, but their range extends into southern Canada's boreal forests, where they can find ample shelter and prey. The taiga stretches from the Newfoundland coast in eastern Canada, northwest into Alaska. It also reaches south into parts of Washington and the New England states. During the summer, the ground often becomes swampy from melting snow. Much of the vegetation consists of coniferous trees, such as fir and spruce. The taiga's heavy tree cover helps bobcats sneak up on their prey and also provides them with sheltered areas to build dens. Winter temperatures often remain around and below freezing, and snow remains on the ground for six months or more. The ground thaws for two to three months during the summer, with plants growing quickly during the short but intense season. Bobcats occupy the southern parts of the taiga. 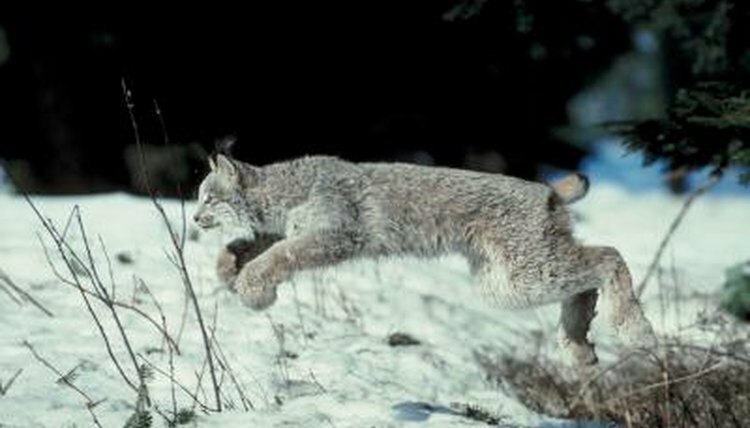 Because they have difficulty maneuvering through deep snow, they don't live as far north as their relatives, the lynx. As temperatures grow warmer, bobcats move further north. Rabbits make up a major part of the bobcat diet, but these felines are versatile and opportunistic. They prey on animals as small as birds and rodents and as large as deer; in fact, bobcats can kill animals 10 times as heavy as they are. In the boreal forest, lemmings, snowshoe hares, squirrels and voles abound. Herds of large herbivores can help sustain bobcats through the winter, when other prey is scarce. In addition, bobcats are among the few taiga predators who can kill and eat porcupines. Bobcats share the taiga with numerous other predators, including coyotes, foxes and wolves; ermines, minks, pine martens, wolverines and other weasels; and lynx, their close relative. Because bobcats adapt so easily to various prey and habitats, they flourish in the taiga despite potential competition for food and resources. Their herbivorous neighbors include elk, moose and whitetail deer, as well as beavers.